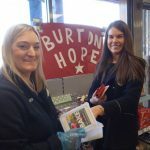 Burton Hope was founded in August 2017 It came about after our chairman John Anderson raised awareness via the Burton mail of the plight of local people that needed help. A local organisation for the local community in and around Burton Upon Trent. 100% funded by donations from local people and businesses. Our work focuses on those in society that struggle to get the help they need from anywhere else. Also making the public aware of what is happening in their own area.We are currently working towards registering with the Charity Commission. in need of support in and around Burton Upon Trent. 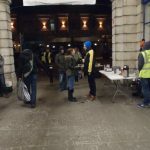 Twice weekly, totaling 80 volunteer hours, teams of trained volunteers scour the local area in search of the homeless to check up and invite to the support resources on offer in the Abbey Arcade Burton Upon Trent. 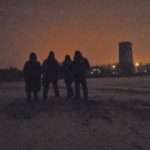 Teams of volunteers offer hot drinks , clothes , food bags to hungry and homeless. Registering with GP’s , Housing, Alcohol and drug rehab referrals, mental health treatment. Donations come into Burton hope from local businesses and individuals, we have volunteers that collect and transport these to our storage facilities. storage of supplies (clothes ,bedding, tents, food, toiletries etc). Anything donated that cannot be used is then passed onto local charity shops. Letting our community know that there are individuals and families that need their help. Thanking donators, visiting schools and clubs to give talks to raise awareness. It is almost like a forgotten people living in a parallel world. A world without love; second (if not third class citizens). These poor folks are often disrespected by the very people who should be offering help. At this point in time our street people are being attacked regularly. 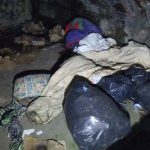 One gentleman had his tent set on fire in the night by thugs. Others are being punched, kicked, spat on; ladies get sexually assaulted. Most of them are too scared to report incidents to the police; we will always encourage them to do so. Through talks, media and our presence on the streets we are showing the reality of what is a huge problem. 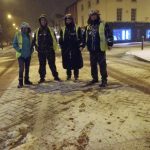 In Burton, at this moment (3/5/18) we know of 44 people sleeping rough! Then the hidden homeless…… Sofa surfers; there are a lot but we have no idea of how many. Then those in expensive supported housing (cost: around £240 per week!) They do not have secure tenancies so are they still homeless? We think everyone deserves a secure home. The support expected is one to two hours per week. Presently, this support is funded by but not checked by the council. How about the unknown number of families and individuals in crisis due to poverty? It is heart breaking taking food parcels; especially to families with children. Our children should not be suffering. We see parents rummaging in bins to get food for their kids! Should girls be taking time off school during their period, because they cannot afford sanitary products? So called “period poverty”! This is the harsh reality that is mostly invisible to normal society and Burton Hope does it’s part to help. Our chairman, John Anderson has been involved with alleviating homelessness and poverty in Burton for many years before Burton HOPE was founded. 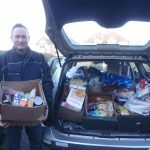 He collected food and distributed it to individuals and aid groups, helped with identity and housing documents, legal issues, healthcare and much more. John’s wife Rachael and son Lewis became involved and the operation became known affectionately as Anderson Aid. Rachael and Lewis are both on the Burton HOPE committee. John used to go out alone on outreach, taking food and clothing to places where homeless Burtonians slept, often into the early hours. Lewis joined him on many occasions. John admits it could be dangerous and at times very upsetting. He has witnessed homeless people dying on our streets, others being attacked, many illnesses and one man was even set on fire by mindless thugs. He often had to administer first aid. On one such outreach session during mid 2017 some upsetting experiences caused him to publish pictures onto social media. The pictures went viral. Helen Knight, a reporter from The Burton Mail asked if she could use the photos. The interest was so great that John used the momentum to call a meeting at The de Ferrers Academy at which Burton HOPE was formed. 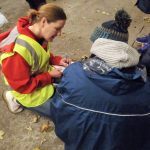 Burton H. O. P. E (Helping our people eat) is a non profit constituted body made up of members who volunteer to help vulnerable people in need, from homeless to the elderly. We aim to become a registered charity one day.